What Gifts Do We Choose? 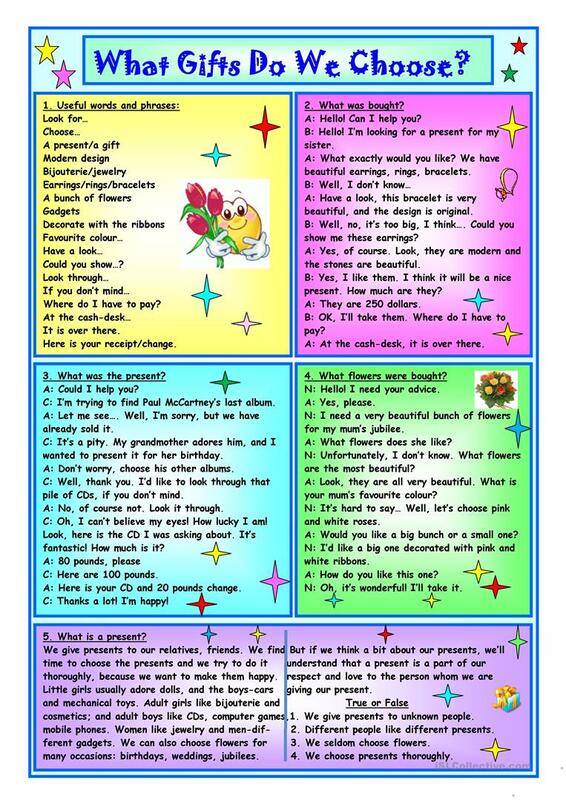 Five exercises on the topic "Buying Presents": useful words and phrases, different dialogues with different tasks, a short story with true or false statements. (I have ws as Tmk939 on ESlcollective.com). Thank you!!! This downloadable handout is a great resource for high school students and adults at Pre-intermediate (A2), Intermediate (B1) and Upper-intermediate (B2) level. It is excellent for developing your pupils' Speaking and Reading skills. It focuses on the topic and words of Shopping.